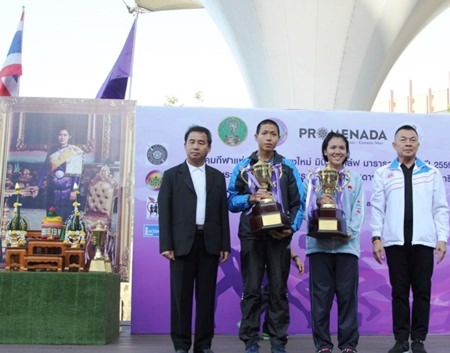 Prasong Jammahasatien, winner in the Men’s 21km category and Wipavee Prathumsuwan in the Women’s 21km category, with their Royal Trophies presented by Chiang Mai Deputy Governor Prajuab Kanthiya at Promenada Resort Mall. The Chiang Mai Mini Half Marathon was held on November 20, 2016 and proceeds from the Half Marathon were donated to Chiang Mai Orphanage and Wat Jan Chalermphakiate 80 years old Hospital, Galyani Vadhana District, Chiang Mai. Awards were handed out at Promenada Resort Mall by Chiang Mai Deputy Governor Prajuab Kanthiya who awarded Royal Trophies from HRH Princess Sirindhorn. The 21 km half marathon was won by Prasong Jammahasatien in the Men’s category and Wipavee Prathumsuwan in the Women’s category. The 10.5 km Mini Marathon was won by Worawith Chanphuthi in the Men’s category and Siriphat Mahawan in the Women’s category. Five hundred and sixty one people from around the country joined in the event that will see funds donated to charity.